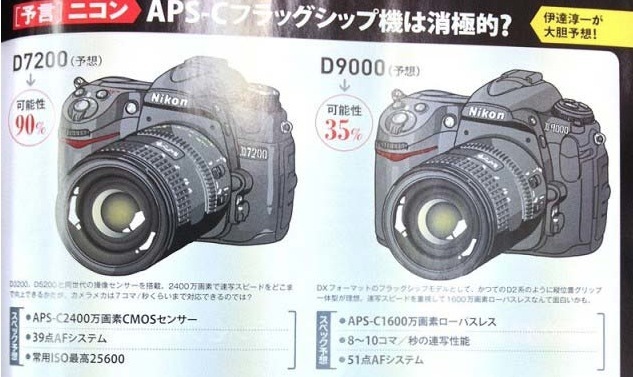 Alongside the Canon 70D and 7D Mark II rumors, a Japanese magazine published its take on upcoming Nikon DSLRs for 2013. The Nikon D7200 (presumably following the Nikon D7000) is rated at a 90% probability with rumored specs that include a 24MP APS-C sensor, 39-point AF and ISO 25,600 sensitivity. Another interesting rumor is the Nikon D9000, which is rumored to sport a 16MP APS-C sensor, 8-10fps frame rate and a 51-point AF system. Presumably this would be a step closer to the Canon 7D or what might otherwise be known as the Nikon D400 (oddly though, that model name does not appear on the rumor sheet). 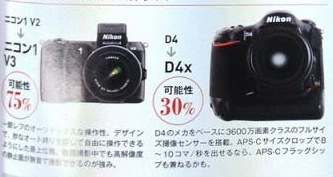 The magazine assigns the Nikon D9000 a 35% probability for 2013 release. Rounding out the rumor mill is the Nikon 1 V3 as the next prosumer mirrorless model with a 75% probability. And, of course, the Nikon D4x with a 36MP full frame sensor captures a 30% probability for a 2013 release. D7200 and D9000 would be really nice. D9000 would be especially for me if the ISO would be on similar level to D3s. My understanding from Nikon staff (at service, Calumet show days, etc.) is that Nikon, realising 36MP would sell to landscape and studio users, went for the D800 shape we see and not the handheld twin grip pro style of the D3/4. A 36MP D4X would not seem to fit in to this logical approach. I just don’t like the look of digital cameras. Film cameras have a nicer look; they’re more even on both sides of the lens. And what about the Hassalblad camera? It has a nice look. So what do you have to say? Hmmmmm…..so no full frame camera with a 24 MP sensor–the sweet spot for using majority of the Nikkor lens line. Only 36 MP full frame sensors which demand the most expensive lenses for best resolving power. Yeah, right………………. To clarify my comment (wee a.m. hours), I should have stated no “pro-grade specs body” with 24 mp to be introduced. And no, I don’t find myself moved by the D600 offering. Was waiting to see if they produced something a step up from this particular body. Very interesting and informative. Thank you. Your D4x rumor is so far off that everybody considers the content illogical. Try somewhere else on the matter, you’ll find other figures, more in line with the strategy of the brand and making more technical sense. D4x with 36 MP, really? ure just a canon fun; really are u scared with 36mp;just live this ure not belong here, go to canon rumors is more worse canon 1dxs 46 mp realllllllllllyyyyyyyyyy!! !